There is a harmony of taxis hooting, gospel music playing and local traders shouting, “Ice! Ice!” in the air. The stench of rotting vegetables and fried potato chips is inescapable. Shops are tightly squashed next to each other on every block. On the sidewalk are rows and rows of black women sitting underneath umbrellas and selling vegetables, all at the same price. These are the sounds, smells and sights of town in Kliptown. Walking west, past the city centre the harmony gets quieter and quieter. A different stench of sewage assaults the nostrils and the amount of people walking around decreases. 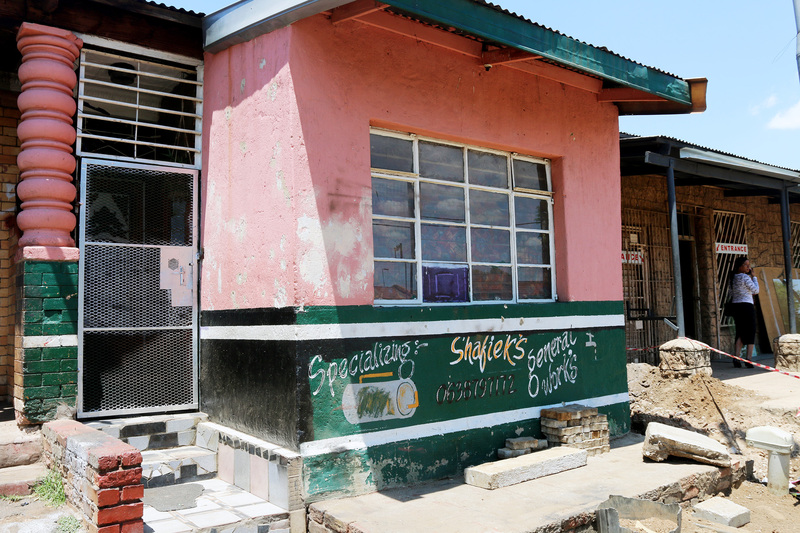 Shops turn into shacks and shacks turning into small homes along the roads. Every once in a while, one can see murals painted on the walls. On Beacon Street, “Pots and gas stoves rented here,” is written on one of the houses and “Shafiek’s General Works” is written on another. The house that has “Shafiek’s General Works” is painted in pink and green, with a shiny silver gate. It is slotted comfortably between another pink house and a glass cutting business. The mural on the wall has a phone number and a crude drawing on a geyser and tap on the sides. Upon walking into the home, on the right is a dark bedroom. The room is filled with the smell of burning incense and reggae music playing softly in the background. There is an Islamic mat hanging on the window and, below it is a shelf with the Quran, many tools and a Dragon energy drink. Below the shelf is a small bed. All along the walls, are shelves holding hammers, electrical drills, wood glue and other tools. SPECIALISING: Shafiek’s General Works owned by Koobatialian Abdulla. The occupant of the room is Koobatialian Abdulla, also known as Shafiek and he is the programme manager of Shafiek’s General Works. The 64-year-old started his business in November 2016, with his daughter and friend. 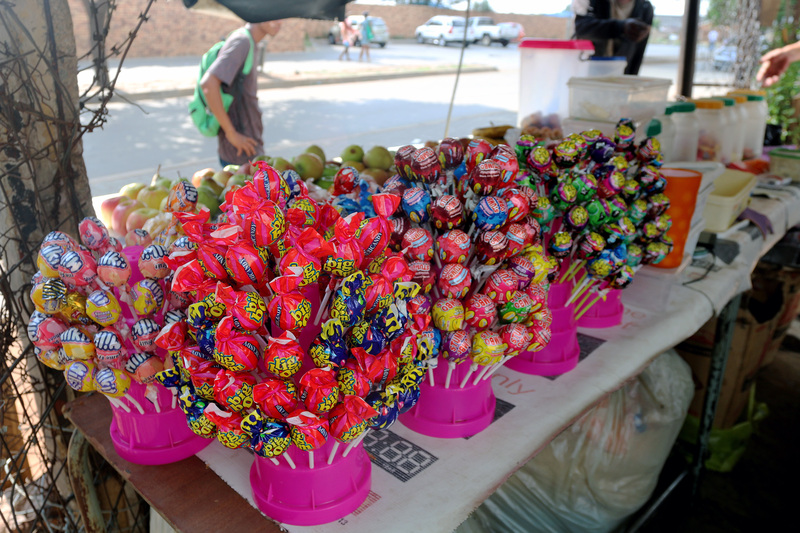 Abdulla is one of many Kliptown residents who started a business and run it from their homes. “It’s like an enterprise. We can repair doors, ceilings and we build carports. We can fix your geyser and do your plumbing. At the moment I am here [home] and I am using it as my office and I want to start building up Shafiek’s General Works,” he says. Abdulla sits on his bed. His hands are wrinkly and weathered from a lifetime of physical work. He is wearing a navy jacket and brown trousers. His shoes are covered in dust and dirt and on his head is a short, rounded skullcap. Abdulla was born in Kliptown in 1953 and was raised in the location. He attended a trading school in the Eldorado Park, where he received a welding qualification. After leaving high school, he would go on to work as a welder. Abdulla picked up skills in his many different jobs, including ship repairs in Angola and construction work. Shafiek started his business at home because he was too old and sickly to do contracted work in contruction and welding. Shafiek did not want to let it go and started his own business and run it from home. “There came a time when my age and health couldn’t allow me to go further and I had a chest condition. I was paid off and told ‘You’re not fit to go to any other place’ and that’s why I’m doing my own thing and doing this on my own,” says Abdulla. DOING MY OWN THING: Marlon Webster looks over his work station. Not far from Shafiek’s General Works, one can see another mural on a wall. The mural says “Marlon’s Take-Away” with paintings of a kota (a hollowed out quarter loaf of bread, filled with a variety of ingredients, often chips, cheese, polony and egg with atchar) at the top and deep fried chips at the bottom. Marlon’s Take Away is owned by Marlon Webster. He started a business in the home that he was born (in 1986) and raised in. The Webster home has a small room in front of the kitchen. The wall direct opposite the door has a deep fryer. The deep fryer is not being attended to but sizzles as potato pieces turn into French fries. Next to the door is a deep freezer with ice lollies or “chuppas” as it is called. Above is a shelf with an array of sauces and spices. Inside the kitchen is a large refrigerator that is full of two litres of soft drinks, along with other groceries of the family. Hanging on the side of the fridge, are large packets holding small NikNaks and other chips. On top of the fridge is a variety of different sweets and biscuits. SWEET TOOTH: Stock of sweets sold by trader in Virginia McDonald’s yard. It is a 12pm on a Wednesday and the heat is almost suffocating in front of Marlon’s Take Away. Two men are lounging in front of the Webster garage occasionally slipping on Sprite, talking to each other and occasionally chatting to the people who walk by. The men have been there since the morning and will probably stay until the evening. A scene like this is not unusual in Kliptown. Many people can be seen sitting outside their homes, chatting with their neighbours, instead of being at work. This scene is normal because of the high unemployment rate in the area. Unemployment is one of the reasons why Webster and Abdulla started businesses in their homes. According to the Quarterly Labour Force Survey released by Stats SA on August 7, the current national unemployment rate is 27, 75%. The same report stated that the unemployment rate in City of Johannesburg Metropolitan Municipality (where Kliptown falls under) is 27, 2%. According to, City of Johannesburg 2012/16 Integrated Development Plan, the current population rate in the municipality is about 4 400 000. “I started the business because I was unemployed and life was tough. So I figured that I’d trying something on my own,” says Webster. He does not have qualification and his odd jobs like fixing roofs did not allow for a constant flow of money. One of the other reasons why businesses are run in homes is lack of capital to afford to rent out a shop space in the area, says Webster. “I have no money to rent a place for the business. It is just easier to run it from here at home,” he says. Despite the high unemployment rate and lack of capital, business owners are making opportunities for themselves and others. Business owners like Virginia McDonald, also known as Ma Lulu. 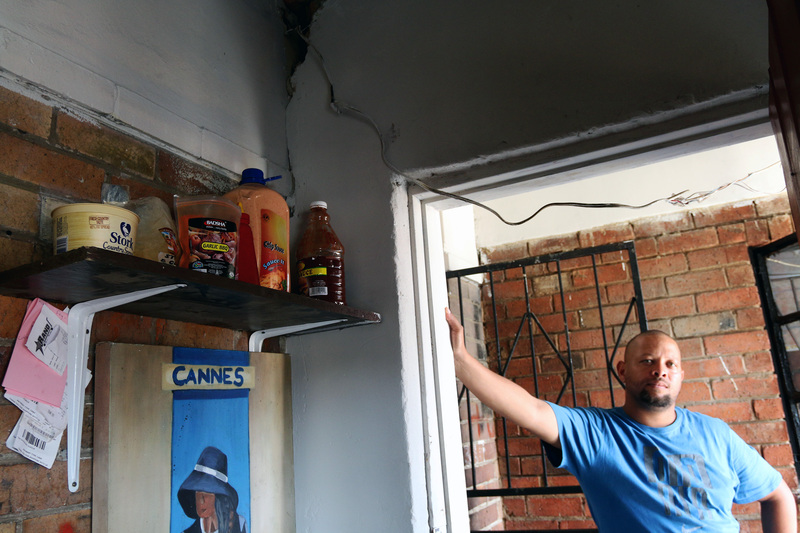 The 60-year-old Kliptown resident owns a take-away business that is currently on hold for renovation next year. McDonald also lets other businesses use her yard to trade and operate their businesses. “You don’t need to wait for the government or your children to come and give you what they feel like giving you,” she says. The home run business owners of Kliptown chose to keep it in the community in regards to stock purchasing, marketing and customer base. “I get my stock from the Kit Kat down the road. Or I’ll stock from the Pakistani and Muslim shops by the square,” says Webster. Kit Kat Cash and Carry is a franchise similar to Macro where they sells bulk merchandise and bulk purchases. Most of the customers that Webster receives are members of the Kliptown community. His customers is also why he started the take-away in his home. Webster has a lifelong relationship established with the community. “I grew up here. People know me and they know that this is my tuckshop,” he says. “We buy some cold drink there, fish and chips and bread and Russians. They are doing well and we can buy nearby instead of going far away,” says another neighbour and customer, Joseph Sithole. The procedure when licencing and getting your home zoned to run business there occurs at the City of Johannesburg, Land Use Management office. They released a Land Use Scheme draft on June 7. According to the Land Use Scheme, spazas or house shops like Webster’s and McDonald’s are required to submit a written consent application with notification of the “direct adjacent neighbours”. The exercising of the spaza should exclusively be for the owner/occupant living in the house. “I used to sell food before, so I’m waiting to get the papers and stuff and fix the place so I can open up something like a restaurant and selling food,” says McDonald about her future plans with her business. They will need to be approved by the council. The Land Use Scheme also states that, the displays on the fences or building that advertise the name, occupation and telephone numbers that are currently on all three of the homes are permitted in compliance with outdoor advertising by-law. McDonald says that her children are currently trying to get her business licensed so she can expand and renovate her shop. “Inspectors must come and inspect your house and come check if the place is alright for what you are doing. I understand that the food or health inspectors will be doing that but my son is still busy,” she says. Abdulla is planning on moving Shafiek’s General Works out of his house and set up shop near his home. “I’m here every day. I’m not unemployed anymore, I’m self-employed. Operating is a very slow from the house, it goes very slow. And I hope to do much better than this when I do move into the other place,” he says. According to him, Shafiek’s only has three or four customers a month, depending on the job. On the other hand, McDonald has no intention to move her business out of her home. “I feel that my house is safe and if they [customers] don’t want to take a take-away, they can sit. If they want to use the toilet, they can use the one in the house,” she says. Individuals like Abdulla, Webster and McDonald are actively using the resources and structures available to them to make opportunities for themselves and others. Individuals like them are what make Kliptown, Kliptown. They strive push past the obstacles of poverty and unemployment in the area and embody the spirit of hustle, hustle, hustle. The sun is setting over Kliptown. People are beginning to slowly trickle from town towards the houses and shacks. The hustle and bustle in town has almost come to a standstill while traders pack up their stands. The harmony has toned down to only the sound of taxis hooting, as people shuffle to return to their homes outside of Kliptown. The stench of rotting vegetable is still in the air. The vegetable ladies pack away their produce and draped their stands with large plastic covers. Lone tomatoes and onions roll around the floor, either waiting to be kicked or stepped on by the rushing commuters. The shop owners have switched the lights and music off. The pack away their products displayed outside. A “ddddrrrrr” sound can be heard as they slam closed their awnings and snap the locks shut. The town has simmered down to a standstill. The streets are almost empty as everyone settles for the evening. Kliptown is still. It will remain like this until the sun rises tomorrow morning and the hustle of Kliptown and its people starts again.